Many of the issues you listed in your post of Jun 26 (greenhouse gases, deforestation, water pollution, overfishing, wetland destruction, desertification) are temporary ill effects that humankind will correct as we gain wealth and power over our environment. As our society became richer, we were able to afford the luxury of protecting the Commons -- and did so. So, I am an optimist that we will solve global problems of deforestation, overfishing, fertilizer runoff creating dead zones in river deltas, ocean pollution, and so on. Whether fluoro-carbons were as bad for the ozone layer as predicted or not, they are essentially banned worldwide. It will take better global cooperation, but I am optimistic we'll handle those problems. Global climate change is another matter entirely. The climate will change! It has been changing for the entire Earth's history, especially in the last 100,000 during the last phase of human evolution. The preponderance of evidence points to accelerating change, and the vast majority of scientific opinion is that mankind has been a major factor. So I predict floods, droughts, storms, warming of many regions (and possible cooling of others). I suspect the ocean rise estimate of 18-to-59 cm (7 to 23 inches) you quoted for the end of this century is optimistic. It may be much more. Climate change will occur, and there is nothing that can be done to stop it. Go ahead and pass your carbon tax laws if it makes you feel better. They will have negligible impact and will be mostly counter-productive. There is no way the rich countries will willingly go back 30 or 50 years in their standard of living, and -- even if they did -- there is no way the populations of the developing countries will be denied their rights to strive to become rich. My recommendation is to increase wealth, foster technology and international trade, try to bring clean water and basic education to poor countries, and make the world's population better able to deal with change. Lake Chalice is happy to hear that human waste no longer flows through the streets of Philadelphia. Your optimism about many of the environmental issues is, we note, paired with pessimism about the climate. Lake Chalice recommends neither optimism nor pessimism, but hope. In 1832, cholera epidemics terrified us. Cholera victims went from perfectly healthy to collapsed, shriveled, and dead in a matter of hours. German poet Heinrich Heine wrote, "It was like the end of the world," -- and many people thought it was. In 1967, William and Paul Paddock's Famine 1975 was a bestseller. It was full of detailed scientific data and reasoning confidently proving that worldwide famine would strike in about eight years. The next year, Paul Ehrlich’s The Population Bomb predicted huge die-offs from outstripping our food supplies. 65 million Americans will die of starvation between 1980 and 1989, Ehrlich predicted,and by 1999 the US population will have declined to 22.6 million. In 1970, Harvard biologist George Wald predicted that civilization will end within 15 or 30 years unless immediate action is taken against problems facing [humanity]. In the same year, Life magazine reported that: "By 1985, air pollution will have reduced the amount of sunlight reaching earth by one half." In 1987, fears of AIDS spreading through heterosexual contact led Oprah Winfrey to tell her audience that "research studies now project that one in five heterosexuals could be dead from AIDS at the end of the next three years. That’s by 1990. One in five." Urbanization from the middle ages through the 18th century exceeded the capacity of cities to handle the sewage of their burgeoning populations. Human waste ran in the streets. Eventually, municipalities figured out how to build sewage systems. Whew! The SOx, NOx, and particulates that make smog were a much bigger concern in US and European cities 40 years ago. Those cities now have much cleaner air. Twenty years ago Mexico City was the most polluted city on the planet, according to the UN -- and today it has air quality equivalent to Los Angeles. A number of rivers, including London's Thames, were once dead. 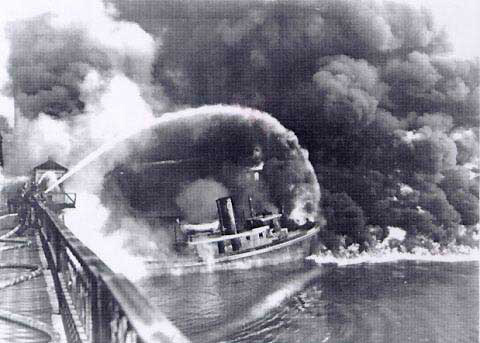 Cleveland's Cuyahoga River actually caught fire in 1969. Today, someone fishing in these rivers might actually catch something. Lake Erie, which Time magazine declared a "giant cesspool" in 1969, had vast dead zones and oil slicks. Massive clean-up efforts succeeded and the Lake today is alive and fishy, its beaches open for recreation. In the 1970s we had concern about chlorofluorocarbons (CFCs) diminishing our ozone layer which shields us from skin-cancer-causing ultraviolet radiation. In 1978, the US, Canada, and Norway banned CFCs. Europe joined in the ban in the mid-80s, and by 1996 the treaty banning CFCs was joined by 160 countries. In 2003, scientists announced that depletion of the ozone layer had slowed significantly. It will continue to diminish for a while because CFCs take 50 to 100 years to break down in the atmosphere. Final recovery of the ozone layer is expected to take another century or so -- but we're on our way. US reforestation is occurring, though it's a bit premature to say that "forests of pre-Colombian times have been restored." The pre-Coloumbian forests were "old-growth" -- which matters because old-growth forests provide the maximum level of bio-diversity including homes to a number of rare, threatened, and endangered species. Old-growth forests east of the Mississippi River got down to 1.2 million acres, now scattered over 88 parks, preserves, and natural areas (over half of that area is in the Appalachian-Blue Ridge forests of Virginia, North Carolina, and Tennessee). Since the hardwood forests of the eastern US take 150-500 years to develop old-growth characteristics, we can't honestly say we have, to date, restored any of the old-growth forestation of pre-Columbian times. Our reforested areas are, however, slowly getting there. In terms of total forest area in the US: the estimate is that in 1630, 46 percent of the land area of the present US was forested. By 1907, it was down to 34 percent. Today, 33.2 percent is covered -- looks like it's been on the upswing, though, at least in the last 20 years. These successes give us grounds for hope -- though we wouldn't say optimism. While air quality in Western cities is much improved, India and China are another story. We may hope that Asia will clean up its air as North Atlantic countries did, but who knows whether they will? Optimism may induce complacency. These past successes at recovering (partly, anyway) from environmental degradation are no guarantee of similar recovery in the future. We cannot sit back and assume that just because we got sewage out of the streets, cleaned up our air and water, banned CFCs, and planted some more trees, we will therefore automatically reverse global deforestation, desertification, overfishing, the remaining forms of pollution of lakes and rivers, ocean dead zones, and loss of wetlands. The successes took a lot of work from a lot of people. What progress we have seen is the fruit of an increased environmental consciousness -- a consciousness which often, though not always, includes a recoiling in horror at such phrases as "power over our environment" (preferring, instead, a notion of "harmony with our environment"). This increased environmental consciousness required generations of nature writers, ecophilosophers and ecotheologians: figures such as Emerson, Thoreau, Darwin, Charles White, Richard Jefferies, John Muir, John James Audubon, Aldo Leopold, Edward Abbey, Rachel Carson, Joanna Macy, Thomas Berry, and Sally McFague. We needed generations of readers reading these writings and discussing them with others. We needed activists forming organizations like the Nature Conservancy, the Sierra Club, Earth Justice, and Greenpeace. You mention economic and technological factors, noting that "as our society became richer, we were able to afford the luxury of protecting the Commons -- and did so," and that we were able to slow down deforestation because oil and cars began meeting our energy and transportation needs, thus freeing the acreage that would have had to be denuded for firewood and horse and oxen pastures. Those factors of economic and technological development are certainly important. Humans have to be able to afford an attitude change in order to make an attitude change. People who worry that their children may not be fed are not inclined to worry that their grandchildren may not have pristine forests in which to have experiences of aesthetic bliss. Some level of wealth is necessary. Technologies that provide environment-protecting alternatives within the means of our wealth are also often necessary. But these things are not sufficient. We also need the aforementioned writers, readers, discussants, activists, supporters, and organizations. We need, that is, the apparatus of moral development, not merely the apparatus of economic and technological development. Economic-technological development may facilitate moral development, but doesn't make it inevitable. Each of us has an active responsibility, we believe, to engage with social and political processes of change to ensure that "affordability of attitude change" and "technological capacity to support attitude change" turns into actual attitude change as soon as possible and on the widest possible scale. To meet this responsibility, we need hope, to know that success is possible, rather than optimism, to lull us with the delusion that success is inevitable. Progress on reversing damage to tropical forests, wetlands, oceans, etc., will, as you say, "take better global cooperation." The question for each of us to ask ourselves, then, is: "And what am I doing to ensure that cooperation happens? What am I doing to develop and extend the consciousness of the Earth's ecological health as the primary ethical, aesthetic, and spiritual value?" The stronger and more widely shared that consciousness, the more deeply felt our eco-connections, the sooner and more secure will be the global cooperation we need. Forget the grandkids; it turns out this was a problem for our parents. Lake Chalice, following Kwame Appiah, had suggested that future generations would find it hard to forgive us for our climate-altering habits -- but maybe those future generations will blame our parents instead! Your recommendation is "to increase wealth, foster technology and international trade, try to bring clean water and basic education to poor countries, and make the world's population better able to deal with change." The Ecospiritual Challenge is to choose neither despair nor defense, but new community. This is a spiritual challenge because the courage to face reality exactly as it is comes from spiritual discipline. Our capacity to hold our world in love, whatever may come -- and I do mean whatever may come -- is developed in spiritual practice and in spiritual community. And where love is, fear and sadness are not. Lake Chalice welcomes your letters. Letters used in Lake Chalice posts have been revised and adapted, and appear without attribution.